Luther's Reformation. 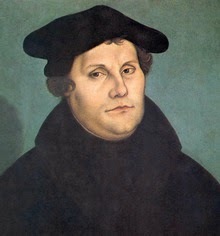 October 31, 1517, Martin Luther posted his 95 theses on the door of the church in Wittenberg, Germany, calling the Christian church to reform its practices so that they would be in line with the Word of God as written in the Bible. It started the reformation and “protest”ant churches. We still need to be constantly vigilant so that negative human desires don’t overwhelm us. We need to insist that those who govern do so justly and fairly. We must work to counter the tendency toward greed, vengeance, and power-grabbing. (OK. It’s Sunday, but you don’t need a sermon here! I am thinking of these things now because the situation in CAR which seemed to be improving has slipped. Rebels have attached the military base in Bouar. This is the town where the headquarters of the Evangelical Lutheran Church – Central African Republic are located. Friends and colleagues live there so it hits closer to home for me – but it is another of the sporadic outburst of violence in the country. It is true that countries in the region have sent troops to help disarm the rebels. I have heard that the process has been working well in the capital, Bangui. I had been hopeful that the process would spread out and bring calm and security to the whole country. Unfortunately, the telephone network is not working well and most calls I try to make into Bouar have not gone through. Through others, I have heard that our colleagues are OK. Many took refuge in a local church or in the fields. Already, October 27, 2013 was designated as a day that all people, of ALL faiths, pray for peace in the CAR. The need is even greater now than before. Pray and work for peace. I decided to write about them despite the depressing news from the country next door. Just past the steps of the back porch of my guest house, black ants that are about ¼ inch long have made a nest. It is a hole in the ground with a mound of dirt around it. They made a trough along which they walk – on the way to find food I suppose. It is fascinating to watch them scurry past. I am glad they are not in the house, though. On a walk yesterday, I saw a trail of other black ants about ½ inch long. Following each other and crossing the road as if they owned it! We, of course, stepped over them. I am very glad they are not in my house either! The ones that are currently in my house – and everywhere – are the very tiny reddish ones (maybe 1/8 inch). I have heard them called sugar ants. That seems to be true. If I leave a juice glass in the sink, within in an hour it will be swarming with these ants. They also go for the sugar cubes other sweet things. On the other hand, they like other things, too: grilled peanuts, greasy pots, toothpaste, open ends of bananas and avocado… I have created a “devise” to keep them from foods I don’t want to refrigerate. There is water in the bottom bowl which keeps the ants away from the top plate (here with the banana). The ants certainly encourage me to do the dishes immediately after I eat (or cook). Who wants a sink full of tiny ants! They have been helping me learn how well I wash dishes, too. If I am not thorough enough, I will find the ants crawling all over what I thought was a clean plate or pot in the drying rack. I must have missed something they can find…. When I rewash the dish/pot, I can usually get it cleaner so the ants don’t do follow-up cleaning. It seems impossible to get rid of the ants, so mostly I co-exist with them. They are on tables, chairs, the bed, books… Fortunately, there are only a couple “passing through” unless I forget to (or incompletely) wipe up a spill. They don’t bite or make noise, fortunately. Well, I am sure I will continue to watch and wonder about ants since they are ever present. The rainy season is soon coming to an end. I wonder if I will see as many ants in the dry season. Time will tell! Focusing on the small wonders of God’s kingdom has helped me in this time of worry about the situation in Bouar. Maybe we can learn to work together like ants do.